Think of this column as one mighty stone being used to kill three birds. 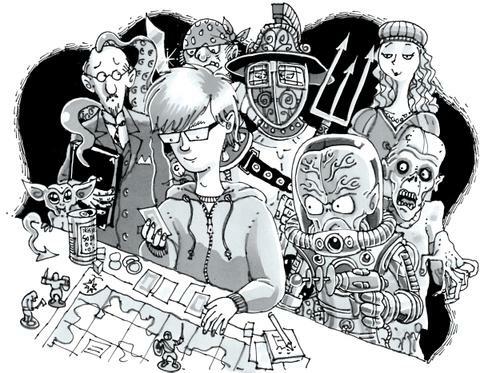 It’s a holiday gift guide, a catch-up on some notable, new-ish (for board games, at least) releases, and an intro to the tastes of three of Calgary’s prime board game institutions: Myth Games, Sentry Box and Dickens Pub’s Gamer Sundays. Because the holidays are all about efficiency, right? Based on Starz’ swords-and-sandals epic (which I’ve never seen myself), the important elements of Spartacus are the ones listed in the game’s subtitle. As the head of one of four rival families, you will plot against your rivals, increase your roster of slaves, and send your gladiators into battle. Each of those elements — politics, commerce and combat — are handled well, but what sets Spartacus apart is the constant negotiation. You can bribe anyone at any time and for any reason, and the rules are quite explicit about not needing to live up to your word. If you’re going to lie, though, make sure you can handle the inevitable retaliation. Another option: Love Letter (Kanai Factory, 2012) is about the simplest game you’ll ever play, but its unique setting (wooing a princess in a royal court) and quick play-time make it a great addition to any gaming night. Eldritch Horror has only been on shelves for about two weeks, but its pedigree says enough. From the publishers of Arkham Horror, Eldritch Horror expands the Lovecraftian madness to a global scale, while streamlining the play experience into something a bit less fiddly than the occasionally overwhelming Arkham. A co-operative game, Eldritch Horror sees up to eight investigators travelling the world, searching for the mysteries of the ancient ones before a powerful evil awakens and destroys life as we know it. It has all the magic, madness and pulpy 1930s atmosphere fans have come to expect from Fantasy Flight’s Cthulhu mythos games, but with new mechanics and an emphasis on replayability that more than set it apart. Another option: Krosmaster: Arena (Japanime Games, 2012) is a miniature combat game with an innovative online element that lets you battle opponents around the world. Smash-Up was seemingly designed to help settle some long-running rivalries once and for all — the base game lets you pit ninjas, zombies, robots, aliens, pirates and dinosaurs into card-based combat — but it’s only gotten better as it’s gotten more esoteric. The expansions released so far include cultists, killer plants and Cossacks riding bears, and next year’s Science Fiction Double Feature will add time travellers, super spies and cyborg apes into the mix. Each player picks two factions and shuffles them into a “smashed-up” army, using their unique abilities to try to conquer bases before their rivals can do the same. It’s not quite as fast-paced as the cartoony atmosphere would make you think — with so many potential combinations, you can spend a lot of time figuring out how the different cards work together — but it’s got personality to spare. Another option: Sentry Box manager Greg liked Star Wars: X-Wing Miniatures Game (Fantasy Flight, 2012) enough to start a league. That’s probably a good sign. The name basically says it all: In Kingdom Builder, you build and expand your settlements with the goal of growing the wealthiest kingdom in the land. The strategy is rich, but the random elements — different goals, terrain and special actions — are what make sure you can’t just rely on the same strategy game after game. “Easy to learn and difficult to master” is pretty much the holy grail of gaming, and it suits Kingdom Builder to a T. And, as with many of the games mentioned here, the expansions have been coming out steadily. This year’s Big Box edition (due out any day now) contains the base game and all four expansions for the full experience. Another option: Quarriors (WizKids, 2011) sees you slowly building an army of dice-monsters to battle up to three opponents, and a steady stream of expansions has kept it interesting.